Core - Allways buy these! Introduction - Welcoming the reader! Introduction - what to expect? Hello fellow SMITE players. Welcome to my Anhur guide. My name is xZeroStrike, and with this guide, I'm going to make an attempt to teach YOU, how to become a better Anhur player! I'm glad you decided to check out my guide, and hope you'll learn something from it. Let's quickly list what we'll be talking about in this guide, and then continue on with the guide, as to not keep you in suspense too long! - Gameplay section, going more in depth. - Warding section, show ward locations for all gamemodes. - Additional/bonus information, for the real Anhur fans. Summary - Who is Anhur? Anhur, Slayer of enemies, is an Egyptian Hunter. Anhur is very powerful, with a kit that allows for powerful combo's and quick elimination of enemies. However, it is also worth noting that Anhur himself, can also die very easily. This is the common archetype with Hunters, they deal a lot of damage, but tend to be very fragile. Thus, in an ideal environment, they'll allways have a guardian with them to protect them. Anhur has, like any other god(ess) in the game, base stats. The base stats determine the strenghts and weaknesses of a god without items. Items are used to enhance these stats, and are usually built in a way to compliment the strenghts of your god. While it is not advised to build around the weak points of a god, doing so might hold some sort of benefit, but is usually much worse in comparison to a build that does work with the strenghts of a god. Just like every god(ess), Anhur has some up- and downsides to him. Items - Outfitted for war! Items are your most valuable properties during the game. They'll make you more powerful, and along with your cunning, will determine wether you'll get demolished, or come out on top. These items are the core items. They are very important and you should get these every time, unless explicitly stated otherwise! Transcendence is probably an item you're familiar with, and for good reason. This item makes a huge power spike for any physical god(ess). It also gives a lot of mana, and some increased mana regeneration. Many players will recommend this item, as most physical god(esse)s are nothing without it. Why and when to buy it? You should buy/finish this item as soon as possible. You'll want to be able to stay in lane as long as possible, so running out of mana isn't an option! Besides that, you'll also want to be able to play aggressive as you can and bully your enemy out of lane. Why play aggressive? Because Anhur's abilities are mostly close-ranged, and you'll be no good at the back line. Warrior Tabi are your shoes on the ground.. They'll give you the gift of moving faster, which is very valuable on the field. Not only do you move faster, it'll also allow you to do more damage.. somehow. It is advised to buy this item second. The movement speed will help you get out of trouble easier and it also provides a good amount of power. Asi is one of the few physical lifesteal items. It has an array of benefits, such as attack speed, flat penetration and lifesteal. This item is also fairly cheap. Buy this item third. You'll need the lifesteal to stay in lane longer and be able to stay after fights more easily. This will potentially increase your farming and lane pushing. From here, you get more freedom in what you want to build. These last 5 items ( Deathbringer, Titan's Bane, The Executioner, Rage, Qin's Sais) all work really well. The only 2 items that should never be together are Titan's Bane and The Executioner, since these 2 "combat" eachother due to how penetration works. Other than that, the choice is yours. Qin's Sais is an item that will prove to be very valuable. Its stats are in line with some other items, but the passive is what makes this item an absolute killing machine item. It'll give power and attack speed. Should you pick this item, you should buy it 4th or 5th. Buy it 4th if you're struggling with tanks by this time. If the tanks aren't a problem just yet, save it for the 5th item slot. PASSIVE - On Basic Attack hits, deal Physical Damage equal to 4% of the target's maximum Health. This only affects gods. The Executioner is another great item, and is very good on Anhur. Since Anhur's abilities aren't as devastating as some other Hunter's abilities (such as Neith's), you'll find yourself using basic attacks more often. Therefore, this item will work really well for you. Why and when to buy this? Buy this item 4th, unless you already have an item there. (This would usually be Qin's Sais.) In that case, buy it 5th. This item is very good. It gives power, attack speed and an armor reduction passive for you (and your team) to enjoy! Rage is an item that most players will pick up if they want a fair chance for critical hits on a god with low attack speed and no "steroid" ability. If you want a fair chance for some critical hits, this item will be for you. This item should be bought 5th or 6th. If you already have a 5th item, buy this 6th. This item allows you to have higher critical hit chances, due to its passive. PASSIVE - If your Basic Attack does not Critically Strike, your Critical Strike Chance increases by 10% (max. 6 Stacks). Resets on successful Critical Strike. Deathbringer is an item you'll find a lot in various builds. That's probably because of its passive, which increases critical damage by 40%. A huge power spike... That is, if you do get critical hits. While you can get this item in any build, it is recommended to mix it with Rage (unless you're feeling really lucky), as otherwise you might not get critical hits and Deathbringer's potential is lost. This item should be bought as the 6th, and only 6th item. Reason being that this item is very expensive, and buying it before may prove inefficient, as you'll be spending a lot of gold on this. However, once bought, this item gives power, critical strike chance and increases critical damage. PASSIVE - Critical Strike damage is increased by 40%. Titan's Bane is an item that you'll find a lot in power builds. The reason is not because of its power (most of the time, at least), but because of its passive. The passive is somewhat similar to that of The Executioner, but with a slight difference. These being that The Executioner's armor reduction is for you AND your teammates, while Titan's Bane penetration is only for you. And The Executioner only gets on par with Titan's Bane when you land 3 consecutive basic attacks, while Titan's Bane penetration is always at full. However, since Anhur mostly uses basic attacks to deal damage, it is advised to get The Executioner over Titan's Bane, unless you can't land consecutive basic attacks. Buy this item 5th or 6th, depending on previous items. Since penetration only matters once you have your power online, it's okay to buy it for this slot. The penetration that Titan's Bane provides is really good, and can help in dealing with tanks. PASSIVE - All of your physical attacks gain 33% Physical Penetration. These items are alternatives. You can choose to swap out the given items from the original build(s) with these. It is advised to only swap when stated in the guide. Bloodforge is a very potent item. However, it is a bit over-hyped. This item does have a very nice passive and stats, but it's a risky choice to purchase it. It grants lifesteal, power and a good on-kill passive. This item is an alternative to Asi. Devourer's Gauntlet is one of the few physical lifesteal items. It needs to stack before reaching full potential, but it is a very rewarding item. Great lifesteal and power, allowing for survival and a positive outcome in some of the more difficult situations. Buy this item third. If you are confident enough that you can survive without the power and movement speed from Warrior Tabi, buy this item second. This item gives a great amount of lifesteal and power, but needs to be stacked, just like Transcendence, before it reaches full potential. If you like stacking items, this item is an alternative to Asi. Do note that you'll be stacking 2 items ( Transcendence and Devourer's Gauntlet) and if you cannot stack quickly enough or stack at all, you'll lose out on a lot of potential. PASSIVE - You permanently gain +.4 Physical Power and +.20% Physical Lifesteal per Stack, and receive 5 Stacks per god kill and 1 Stack per minion kill. (Max. 75 Stacks). Abilities - Dance like a lion! Abilities - Show me your skills! The items are a very important concept for any god(ess), but abilities are no less. The abilities are what makes every god different from one another, and also determine the playstyle of that god(ess) on the battlefield! Here, I'll be talking about Anhur's abilities and some combo's that you can do with them! This list will show you Anhur's abilities, what they do, when to level them up and how/when to use them. Anhur's spear attacks reduce the enemy target's Physical Protection for 3 seconds by 20. This ability should be leveled second, as it has powerful buffs. Use this ability on an enemy to block movement, slow them and increase your damage against them. Can also be used to block some projectiles. This ability should be leveled first, as it is your main clear and damaging ability. Use this ability to clear waves, damage/poke enemy gods or stun them when possible. Can also be used to knock enemies away from you. This ability should be leveled third (last), as it should mainly be used to escape. Use this ability to escape or to damage and knockup enemies. This ability should be leveled whenever possible, since it has a high (possible) damage output. Use this ability to damage enemies and finish off low health enemies. Use this ability to attack enemies behind walls and get the drop on them. This list will show you various (creative) ways to combine Anhur's abilities, so you'll not only look like a professional, but also make the most of them. Sidenote: These combos are NOT easy, keep that in mind. Losing a boxing match? Place down your Shifting Sands between you and your enemy. Circle around it so that your enemy is allways directly behind it from your point of view. Lines of sight and projectiles are now blocked. Now use Desert Fury to attack through your obelisk and hopefully get the upper hand in the fight. Conclusion - Nearing the end! Anhur is a complex but fun god to play. He has a lot of potential, but has quite the learning curve for the player to be able to reach that potential. His skills are fairly hard to combo, and his close-range abilities and attacks make it even harder to play with him. However, once you do get skilled enough to roll some great games with Anhur, it feels twice as rewarding! - Hi-Rez Studios: Creating SMITE, adding Anhur to the game. 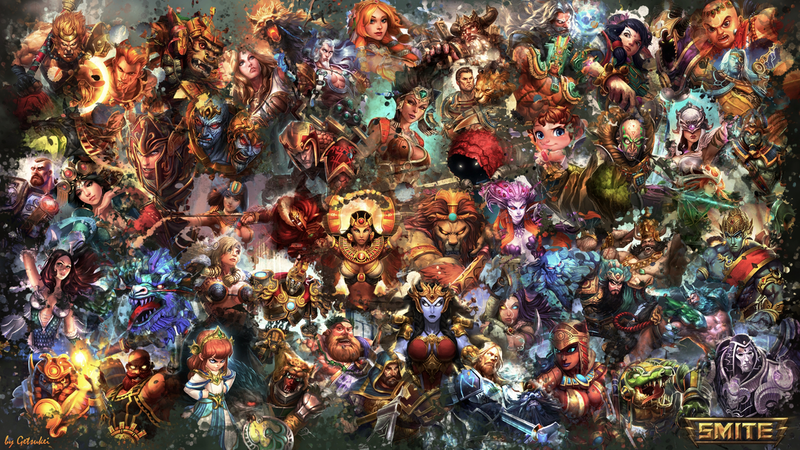 - SMITEfire: This website, allowing me to write this guide. - Zeus Tube: Creator/owner of the ability videos. - Myself: Writer and coder of this guide. I hope that you learned something from my guide, and that it may improve you in playing with Anhur. So, ladies and gentlemen, 359 views later I get to share this knowledge with you! This was my attempt, at making YOU, a better Anhur player! Happy smiting! Guide update - Removed Devourer's Gauntlet from core, added Asi as core. Added Devourer's Gauntlet as Asi alternative. Added Asi information. Added color white to emphasize important details in the guide. 111363 xZeroStrike Thanks! Will do! I dont like the double stacking idea on Anhur, on any hunter actually. Transcendence costs alot to get and then dev gloves needs alot of time to stack. I would either get one or the other in all honesty. Anhur is a very potent early game hunter and building double stacks hinders that. 111297 GameGeekFan I dont like the double stacking idea on [[anhur]], on any hunter actually. [[transcendence]] costs alot to get and then dev gloves needs alot of time to stack. I would either get one or the other in all honesty. [[anhur]] is a very potent early game hunter and building double stacks hinders that. Noted. Figured this would be a problem for some. Thing is that with Asi you lose power, Soul Eater has no power at all, and Bloodforge is outright expensive. I'll add Asi as an option, I think that'd be the best. 111302 xZeroStrike Noted. Figured this would be a problem for some. Perhaps [[Asi]]? Thing is that with [[Asi]] you lose power, [[Soul Eater]] has no power at all, and [[Bloodforge]] is outright expensive. I'll add [[Asi]] as an option, I think that'd be the best. You're guide is really good for any New Anhur Player or anyone that looking to get better in him, your Guide has photos and icons and such which make it enjoyable to read. you got My Up-Vote. but i recommend you to add more Colors instead of Everything being Orange, especially in the abilities Chapter. 111296 nikvundle Hello there. You're guide is really good for any New [[Anhur]] Player or anyone that looking to get better in him, your Guide has photos and icons and such which make it enjoyable to read. you got My [color=#00ff00]Up-Vote[/color]. but i recommend you to add more Colors instead of Everything being [color=#ff8000]Orange[/color], especially in the abilities Chapter. Thank you, will work on some coloring, while trying to stick to the general coloring template. 111303 xZeroStrike Thank you, will work on some coloring, while trying to stick to the general coloring template.